Dog lovers unite! Chewy carries all you need for your lovable pup all available at the click of a mouse. Spoil your puppy with only the best in dog supplies for dog food, dog treats and dog toys. If you've been searching for duck flavor dog prescription food, look no further. 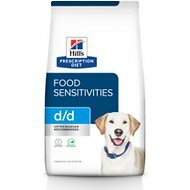 Among the wide selection we carry, one option to try is Hill's Prescription Diet d/d Skin/Food Sensitivities Potato and Duck Formula Dry Dog Food. Key benefit: helps improve digestion and stool quality with visible improvements in the skin and coat. 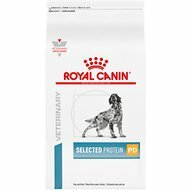 Another product is Royal Canin Veterinary Diet Selected Protein Adult PD Dry Dog Food. Key benefit: the protein in the diet is provided by potato, duck and hydrolyzed soy, which rarely cause food sensitivities. From nutritious dog food to fun dog toys, Chewy has it all! You'll find everything you need - and if you have any questions be sure to reach out to our customer service available 24 hours a day, seven days a week. For all your pet needs including duck flavor dog prescription food, Chewy has you covered! We're here for you.